Fluciclovine scan (also known as an “Axumin PET/CT exam”) is a nuclear medicine study using positron emission tomography (PET) with computed tomography (CT) to localize recurrent disease in patients who were previously treated for prostate cancer and now are presenting with increased prostate specific antigen (PSA). Fluciclovine is a synthetic amino acid analog. Amino acids are the building blocks of proteins. They are usually used by the cells for growth and metabolism. In prostate cancer cells the need in amino acids is increasing. Therefore, the uptake of fluciclovine will be high in prostate cancer cells and low in normal cells. Fluciclovine PET/CT exam was recently approved by the US Food and Drug Administration (FDA) for the evaluation of patients with suspected recurrent prostate cancer. Fluciclovine PET/CT nuclear exam may be positive when other exams are negative. The higher the PSA level, the higher the chance of the scan to be positive. However, fluciclovine scan was as well reported to be positive when the PSA was less than 1 ng/ml. The greatest strength of fluciclovine PET/CT is in the localization of small metastatic lymph nodes and its performance was found to be significantly better than that of CT scan. For bone lesions, fluciclovine may demonstrate intense activity in lesions that cannot be well seen on CT images (small lytic lesions) but may show no uptake in lesions which appear dense on CT images (sclerotic lesions). Therefore, a bone scan is recommended to evaluate bone lesions. In many cases, fluciclovine PET/CT exam changed the treatment plan of patients. Figure 1. 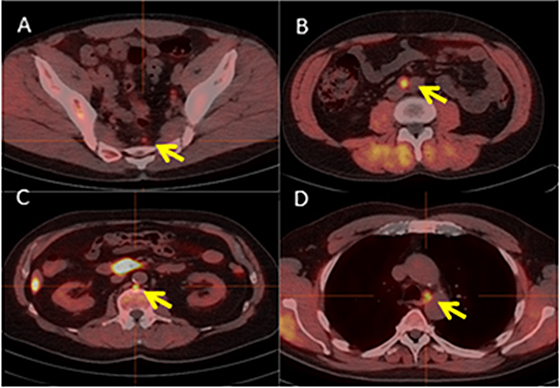 Fluciclovine PET/CT scan in patients who found to have less than 1 cm metastatic lymph nodes (high uptake of fluciclovine). Based on CT criteria, less than 1 cm lymph nodes considered to be normal (not cancer). Image A: Uptake in a 5 mm pelvic pre-sacral lymph node. The patient was planned to undergo whole pelvis radiation therapy. Due to the fluciclovine PET/CT scan, the radiation zone decreased to cover only the lymph node area. The PSA level went back to zero. Images B, C, D: Unexpected presentation of normal-sized lymph nodes outside of the pelvic (B, C: higher abdomen, D: chest), highly specific for metastatic disease. Conventional whole pelvic radiation therapy (if was given) would have been failed. Figure 2. 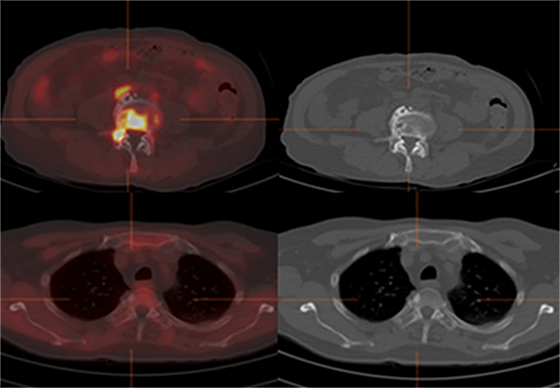 Images A, B: Fluciclovine PET/CT scan demonstrates intense uptake in lytic bone lesions. Images C,D: Fluciclovine PET/CT scan demonstrates no uptake in a suspicious sclerotic lesion. Therefore, fluciclovine PET/CT scan cannot replace bone scintigraphy, such as Tc99m-MDP or F18-NaF bone scans.